Kits shipped in 24 hours. Start building with online tutorials. If you are a parent & want to spend "learning time" with your kids just like you did few years back, this is the perfect way to do it. Simple drag & drop block programming that helps your kid develop logical/ algorithmic thinking. No need to write 'code'! Innovative learning methodology that ensures your kid is learning while building. 1-1 expert assistance provided. 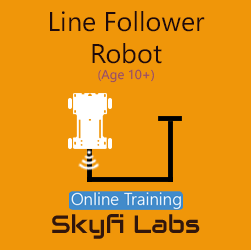 Skyfi Labs Project Based Courses serve as an effective platform for the school students to take their first steps in robotics. 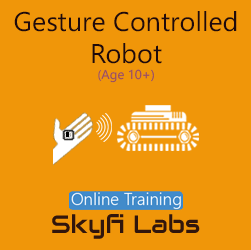 You can get your kids started in Robotics in a very cost effective manner. 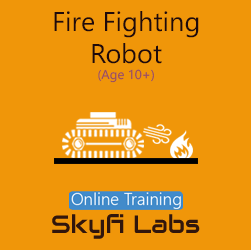 School students can either learn to build robots from their home with the help of Skyfi Labs Online Courses (with your help as needed & It's great fun to build Robots with your kid!) or they can learn from our experts by attending a trainer-led classroom training program on robotics. You can organize our Robotics Workshops in your school/ community and our trainers will be there with the kits and necessary materials to help your children to build robots. Following an innovative Learn-Do-Review methodology, these courses engage your kid through practical learning while teaching them the technical concepts and physics that move the world forward. There are also a number of quizzes to keep their brain working, thinking and asking right questions. With all the things in the right place, our school level robotics courses are sure to give a great start to your kid's journey in robotics. Why Robotics Courses for School Students? Robotics is one of the most promising technologies that is going to find its place in almost all the applications of future. From industrial manufacturing and space exploration to driving your car and preparing food in your kitchen, all activities are going to be done by Robots. Robotics was never more important than today. Robots bring a lot of efficiency, accuracy and reliability at low costs, making them ideal for applications all over the world. Students should start learning Robotics and develop an understanding on the technology from school level. This will give them the ability to understand the world and the way the world is getting shaped. Learning Robotics also help students to develop much needed competencies like critical thinking, structural thinking, creativity and problem solving abilities which are hard to learn through conventional classroom sessions. Robotics help students to understand how science and technology is impacting the world through innovative implementation. 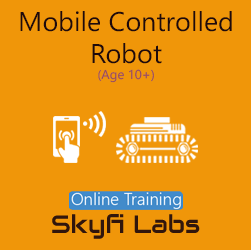 Skyfi Labs Robotics Courses for School Students are developed keeping this in mind to deliver the right content in the right way. 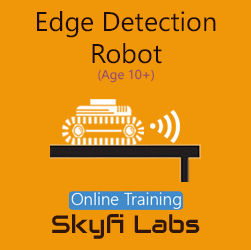 The Robotics Kits specially designed for School Students along with the detailed theory - in videos for online course or from trainer in workshops - help school students to understand the technical concepts while building with the kits. 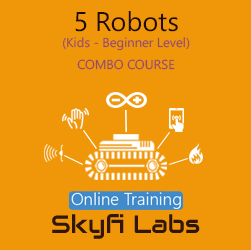 Skyfi Labs Robotics Courses for School Students are designed in a way to start from basic concepts and build as they learn. Students also build robots practically while learning the concepts and this gives the right mix of learning and fun, keeping them engaged throughout the course. 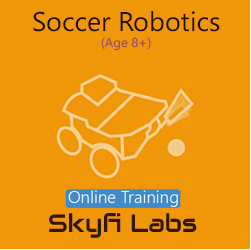 You should get your kid started on robotics as early as you can and Skyfi Labs Robotics Courses for School Students provide the right path for you to do this.